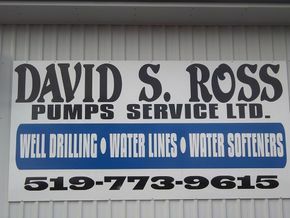 For over 30 years, David S. Ross Pumps Service Ltd. has served the Elgin county area. We repair and service existing water lines and pumps, as well as installing new units. We provide quality water services, such as putting in reverse osmosis drinking systems or iron filters, for residential and commercial clients in the Springfield area. We offer some of the best brands available to make sure that you have a lasting water system. We can give you a free estimate on you project today!